Get A Look At This Impressive Custom Built 1982 Yamaha Virago Cafe Racer! When people want a custom bike, but are clueless on where to start they will often seek help from a professional. In this video we meet Jake Bandaruk who sought help from a local Los Angeles motorcycle builder to customize his 1982 Yamaha Virago Cafe Racer. Jeffery of JTEC MOTO included several different customization’s and upgrades throughout the build. In this video he goes into full detail on the changes he made including the Yamaha R6 front end, rear mono shock and tail light assembly and much more. To hear about the bike from the owner and the builder click the video below! It is definitely one impressive build that you do not want to miss out on! 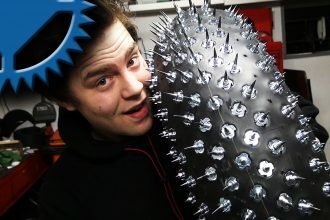 How To BUILD Ice Racing Tires For Your BIKE!!! Full Review Of The Epic Suzuki GSX S1000F! Check Out The Pristine 1950 Jawa Vintage Motorcycle!